I’m always looking for new quick meals that are Specific Carbohydrate Diet (SCD) legal. Lets be honest, sometimes having to cook everything from scratch can be so difficult especially when there are jobs to be done, children and husbands to be cared for and a house to be cleaned! I tend to save my labour-intensive cooking marathons for the weekend so I can spend more time with my daughter during the week after work. Having leftovers, freezer dinners or quick meals means more time to play outside or go for a walk with Ciara which is priceless. I’ve been a little obsessed with cauliflower “rice” since I first made it a few months ago. Now it’s definitely a weekly dish for me. It’s easy to whip up and so versatile. 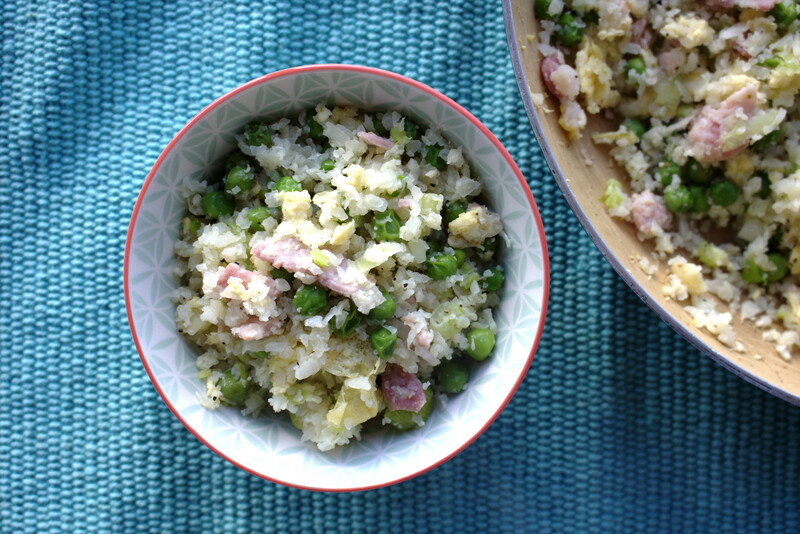 This week I made this version with bacon, spring onions and peas and it was so unbelievably good that I had to stop myself from eating the whole lot in one go. I love that it tastes like a carb but instead you’re fueling your body with vitamin C, vitamin K, vitamin B6, protein, thiamin, riboflavin, niacin, magnesium, phosphorus, fiber, folate, pantothenic acid, potassium, and manganese. Trust me you should make this: your body and your taste buds will thank you! A delicious, healthy and quick meal that will soon become a weekly staple for you! 1 Cauliflower, grated* *You can grate the cauliflower either with a cheese grater on the biggest side or in a food processor on high. Heat a frying pan on medium with no oil first as the fat from the bacon will be enough. Cook the bacon for a few minutes until cooked through, a little crispy but not burnt. Remove the bacon and set aside on a plate. Pour the olive oil into the pan next and place back on a low heat. 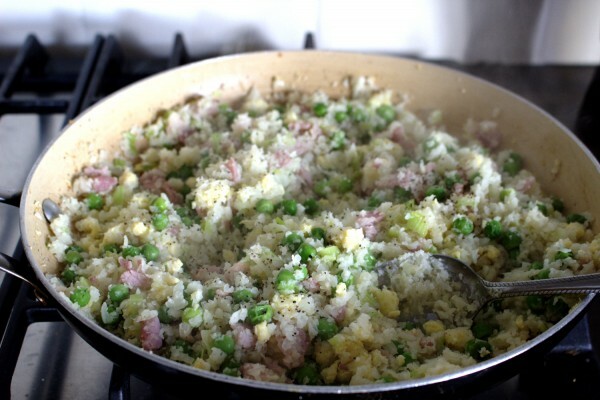 Add the cauliflower and cook, stirring often for at least 5 minutes. 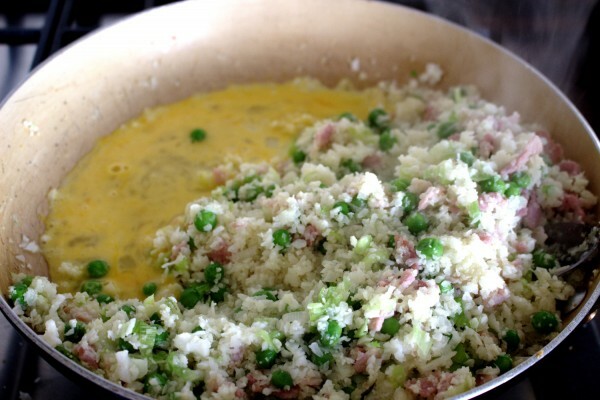 Next add in the spring onions, frozen peas and add back in the bacon. Season with a little black pepper. I don't find it needs salt because of the bacon. 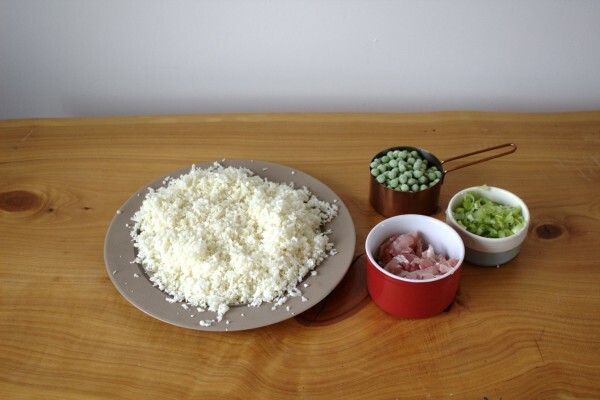 Continue cooking for a further 8 minutes so that the peas are fully cooked making sure to stir often so that it doesn't stick to the bottom of the pan. Meanwhile, crack and beat the egg in a bowl. Push the mixture to one side of the frying pan and pour in the egg. Allow it to cook for 1-2 minutes until it cooks underneath. Then break up the egg with a knife and fork and mix through the cauliflower. Cook for a further minute or two until the egg is fully cooked then enjoy!